Indian Ambassador to Israel fulfills his PM's promise, grants Moshe Holtzberg and his grandparents entry visas to India. Moshe Holtzberg, the son of Chabad emissaries to India Rabbi Gavriel and Rivka Holtzberg, received on Wednesday an entry visa to India. India's Ambassador to Israel granted Holtzberg the visa after Indian Prime Minister Narendra Modi promised the visa six weeks ago. Holtzberg's maternal grandparents, who are raising him, also received an entry visa. During his visit to Israel, Modi met with Israeli Prime Minister Binyamin Netanyahu, Moshe, Sandra, and all four of Moshe's grandparents. Both Gavriel (Gabi) and Rivka were murdered in 2008 when Muslim terrorists entered their Chabad House and slaughtered them. Moshe's life was saved by his nanny, Sandra, who managed to escape the area holding him in her arms. According Moshe's grandfather Shimon Rosenberg, Moshe plans to take his parents' place as the Chabad emissary to India when he gets older. "He was born there, and for him, that's his home," Rosenberg explained. "He wants to hold his bar mitzva in India, and go on a tour of the area to find his roots. Obviously, he will also visit the grave of the Lubavitcher Rebbe at the same time." 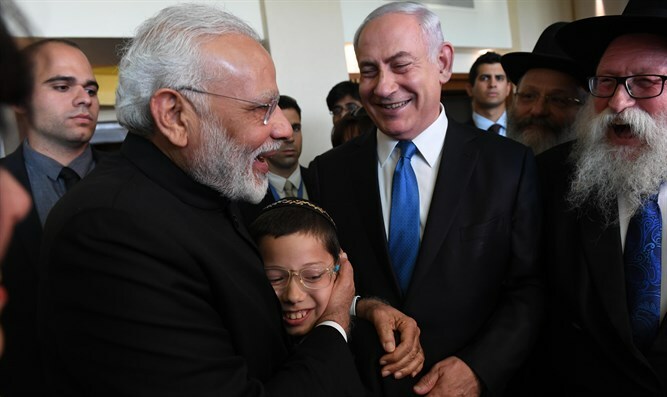 "Moshe told me yesterday that the Indian Prime Minister said that when he's eighteen, he can go back to India and be a Chabad emissary and the country's Chief Rabbi."